Amazing dish! I'm not a HUGE fan of squash or garbanzos (Indian cuisine excluded), so I was wary to make this. The giardiniera (pickled Italian antipasto mix) gave the right amount of tang and zest, and there was plenty of cheesy mozzarella goodness. 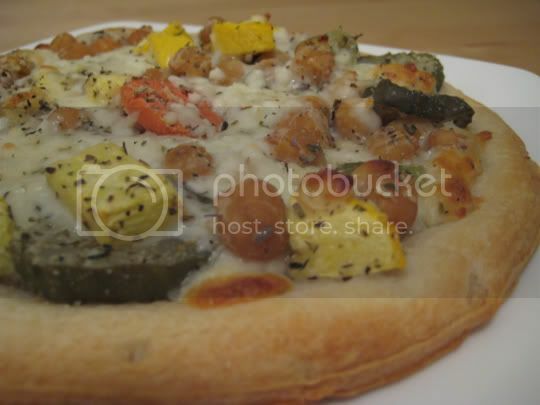 Recipe notes: The "salad" mixture makes easily enough for four pizza shells, not the two listed in the recipe. Also, I had to bake this for much longer than the said 5 minutes--one pizza took probably about 15 minutes. Maybe it was all the cheese! Make again? Definitely. This would be fun as bite-sized appetizers too.